CAMP NAKAR, LUCENA CITY – The head of the Southern Luzon Command (SOLCOM) here said the Communist Party of the Phil and its armed wing New People’s Army have now completely lost their ideology, with no more hard-core members in their armed struggle but remnants who are engaged in criminal activities or inciting people on socio-economic issues in far-flung areas. “On a scale of 1 to 10, I rate them at 4 and they have no more causes, pera-pera na lang sila ngayon,” SOLCOM chief Maj. Gen. Gilbert Gapay told the local media in a press conference held Tuesday at the Officers Clubhouse here. Gapay, along with Maj. Gen. Roderick Parayno, commander, 2nd Infantry Division and Brig. 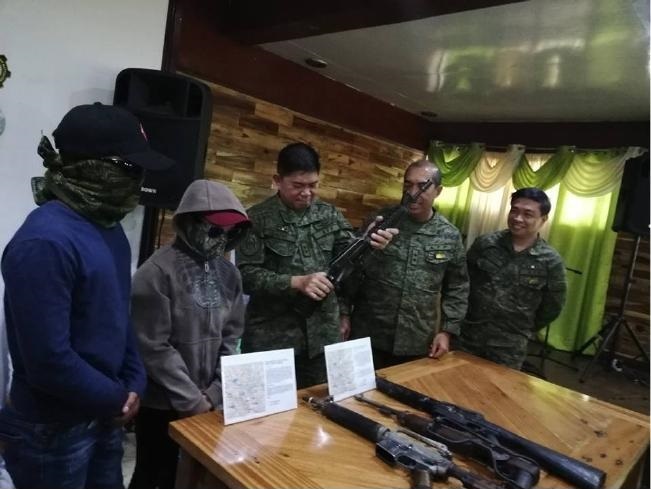 Gen. Arnulfo Burgos, commander of 202nd Infantry Brigade presented to the media 2 young NPA rebels who surrendered to the military on Monday, Jan. 28, in San Juan, Batangas along with their seized firearms – M1 Carbine, Caliber 22 rifle, a Bush Master and a M653 rifle. He identified them as Ka JR, 21 yrs. Old and Ka Lovely, 20, both fully covered in the face and belonged to Platoon Galaxy of the NPA unit Honda guerrilla front which operates in Batangas but has now been dismantled. Ka Lovely has been recruited to the movement since she was 16, while Ka JR joined the NPA when he was 20. Gapay said a total of 33 rebels have surrendered with firearms since the New Year and 25 of them have been covered by the ‘Balik-Loob’ program of the government called Enhanced Comprehensive Local Integration Program which entitled them to a package of benefits from various government agencies. He said the military will try to undo wrong indoctrination to these former rebels who will stay in a government-designated halfway house before they are reintegrated to the mainstream of society and live a normal life again. “What the communist rebels have been fighting for is a lost cause. The government brings development programs to far-flung areas which are usually where the NPA lairs are found. We are continuously pursuing reform initiative in our armed forces to earn the people’s trust,” Gapay said. The SOLCOM chief placed the NPAs strength from 25,000 in the 1970s to 3,700 at present nationwide and from 600-650 in Southern Luzon areas. Gapay said they are also in preparation for the coming midterm elections to keep the process free, independent and peaceful from NPA interference particularly with the rebels ‘permit to campaign and permit to win’ deceptive schemes.